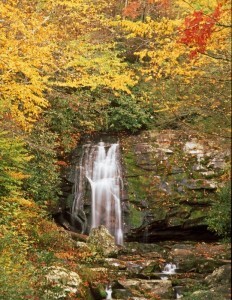 One of the great delights for visitors to Great Smoky Mountains National Park is the abundance of beautiful waterfalls. Usually it takes at least a mild hike to see them, but Meigs Falls is a waterfall you can see from the road. 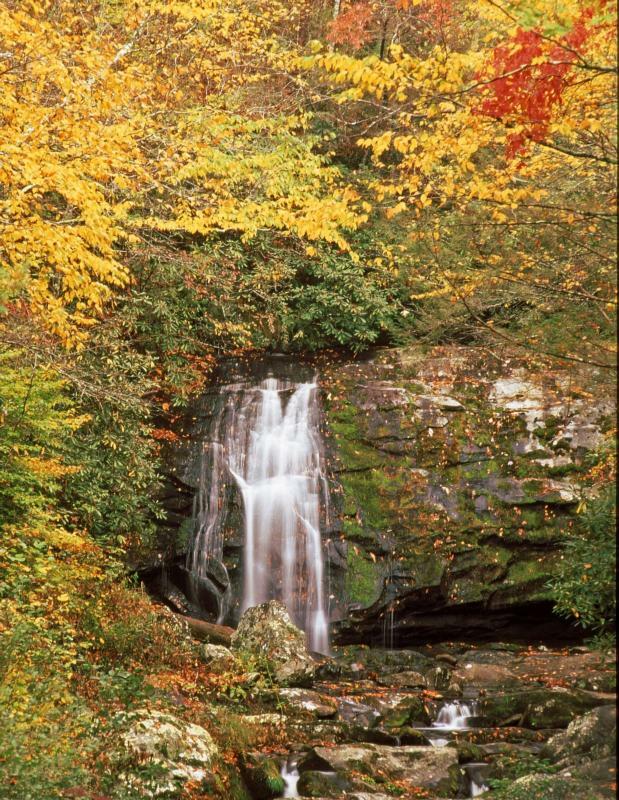 Meigs Falls lies along a great scenic drive in its own right, Little River Road between Gatlinburg and Townsend. Many people know this road as their way to Cades Cove, but they may well have missed the falls, which is tucked away across the river and hard to spot. Fortunately there’s a large turn-out to pull off from the road where you can park and get out of the car. Meigs Falls is about 300 feet back from the road, and if you’re looking for a perfect shot, a tripod will help with your camera zoom – waterfalls can be tricky to capture. Be warned against trying to venture closer to the falls from the road. It’s farther than it looks when you actually have to hike to it, and it’s not a natural trail, to climb down the bank and wade across the river. This is NOT recommended. The riverbed is rocky and uneven, and the water can be VERY fast, easily enough to sweep you off your feet. For the work you’d have to put in to get closer to Meigs Falls from the road, you’re better advised to take a real hike along an easy or moderate trail, which can bring you to some of the abundant waterfalls close by. Meigs Falls itself can be reached from the Meigs Creek Trail a mile down the road, which is a lovely trail with numerous water encounters along the way. And the hugely popular Laurel Falls trailhead is only a few miles farther down Little River Road. Take advantage of Meigs Falls as a gift to those who can’t easily hike in the Smoky Mountains, those physically challenged or with very young children or pets. Meigs Falls is one of only two drive-up waterfalls in the area (the other is off of Roaring Fork Motor Nature Trail – called Place of a Thousand Drips). How to get there: From Sugarlands Visitor Center in the national park on the edge of Gatlinburg, drive almost 13 miles west. The turnout will be on your left. You’ll pass the Sinks and Meigs Creek Trailhead parking area about a mile beforehand. From Townsend the turn-out is 7 miles, or about 4.7 miles from the “Y” junction with Laurel Creek Road.